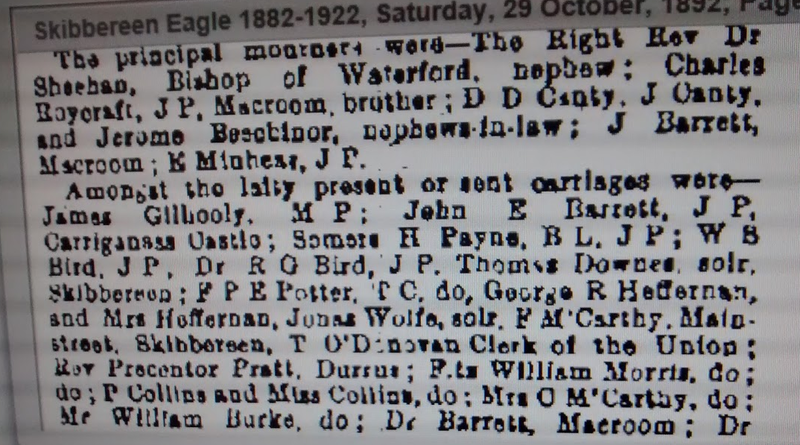 Funeral Attendances of Mrs. Dillon, Bantry, and Mrs. Hadden, Skibbereen, West Cork. 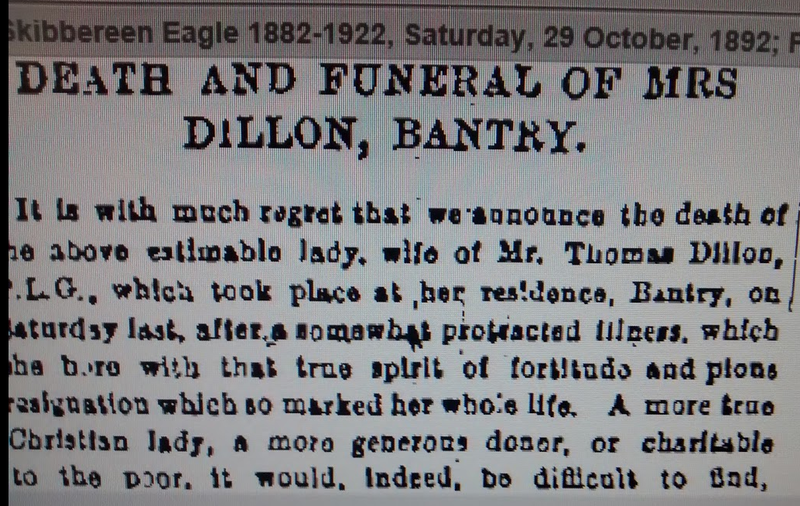 The Dillons in Bantry were ‘well got’ with Mr. Dillon a Poor Law Guardian and possibly Master of the Workhouse. 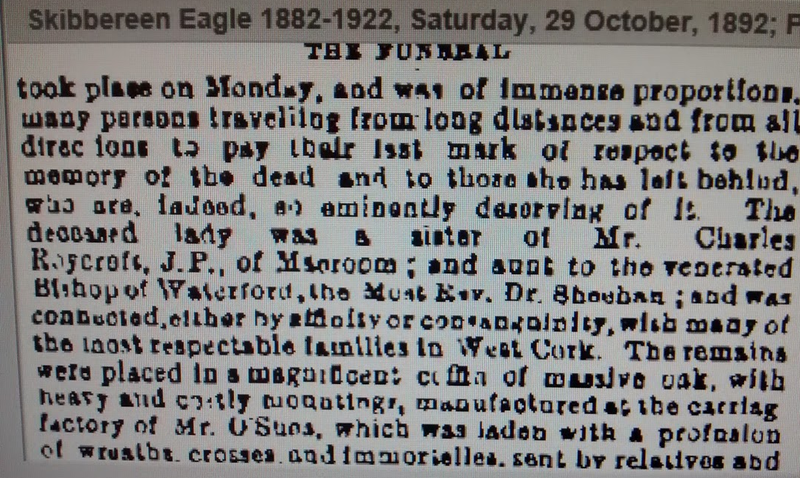 They may be connected to the Dillons of Clashadoo, Durrus who are buried in an enormous tomb in Moulivard Graveyard, the last of the family, Shaun was buried in the 1980s. 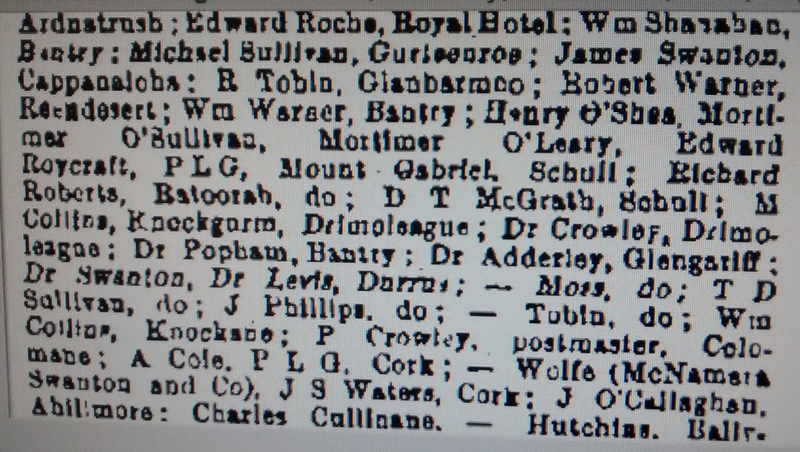 he inherited a pub and substantial properties in Bantry from his aunts and was active in the late 1940s in Clann na Poblachta. 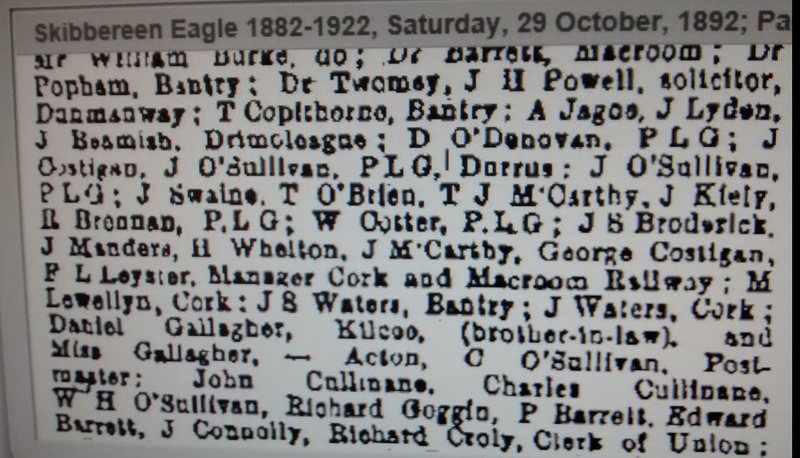 There was another prominent Dillon family in Bantry mid 18th century Protestants, whose daughter was married by a ‘Popish Priest’ to one of the Bantry Whites. 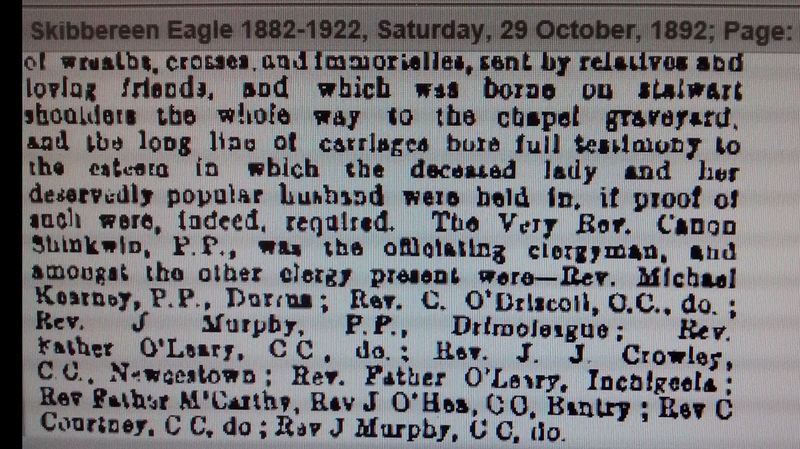 He sought to marry another and this resulted in her lodging a caveat in the Diocesan Ecclesiastical Court in Cork. 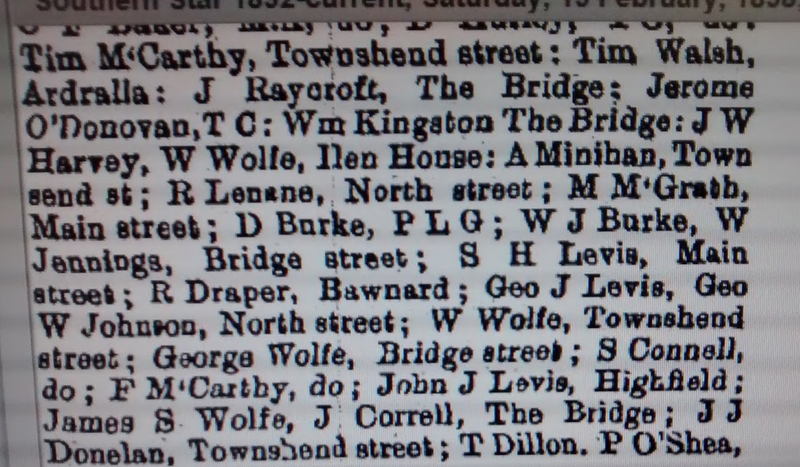 Mrs Hadden may have been an Evans from Lissangle, Caheragh, daughter of William Esquire. 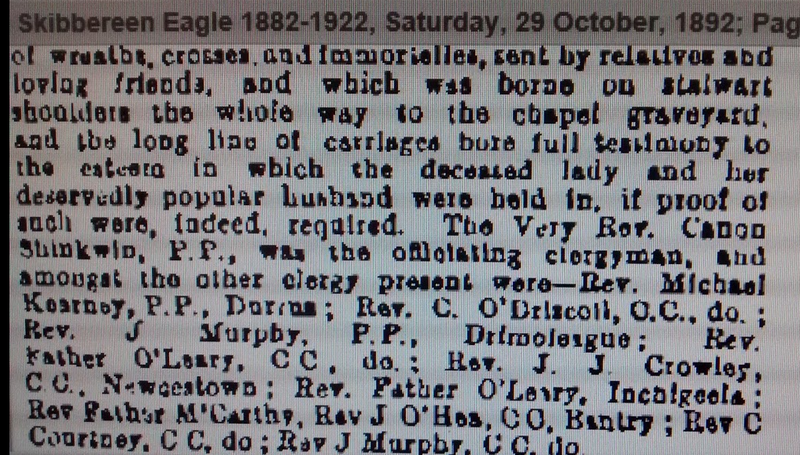 She married an apothecary, whose Methodist family originated in Wexford. 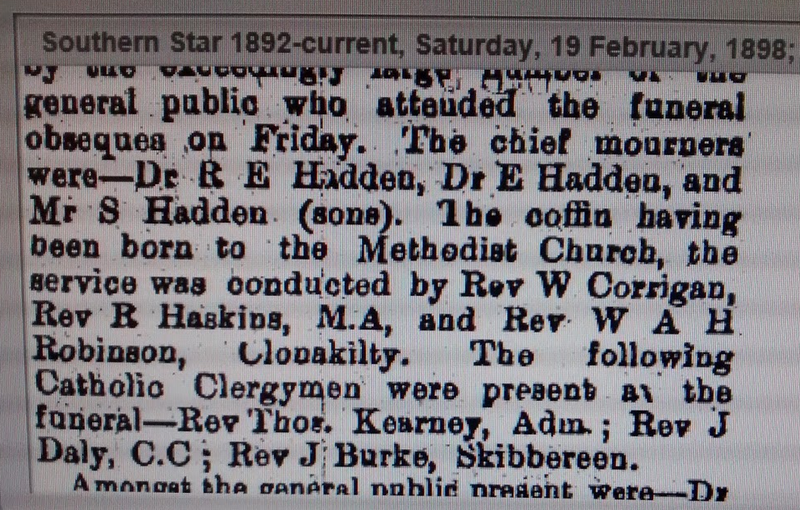 In the 19th century the Haddens were prominent in Skibbereen in the Methodist Church and as Doctors. 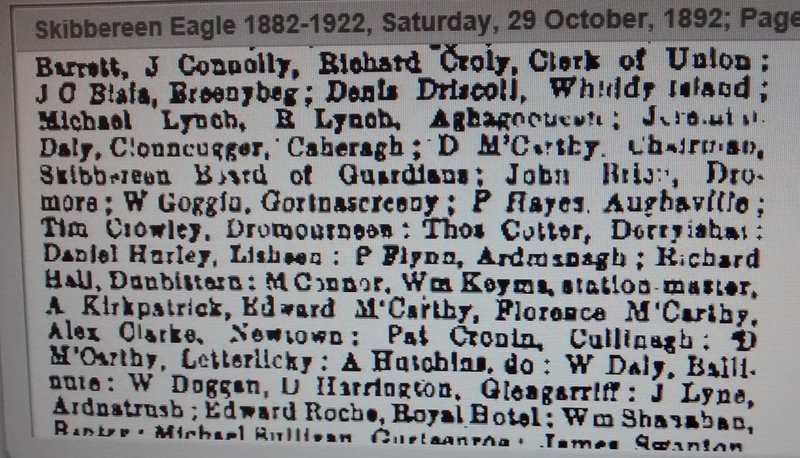 Her sister or aunt may have married in 1810 James Crowley apothecary whose brother Jeremiah (Jerry) was also an apothecary and known as Dr. Jerry a founder of the Phoenix Society a precursor of the Fenians. 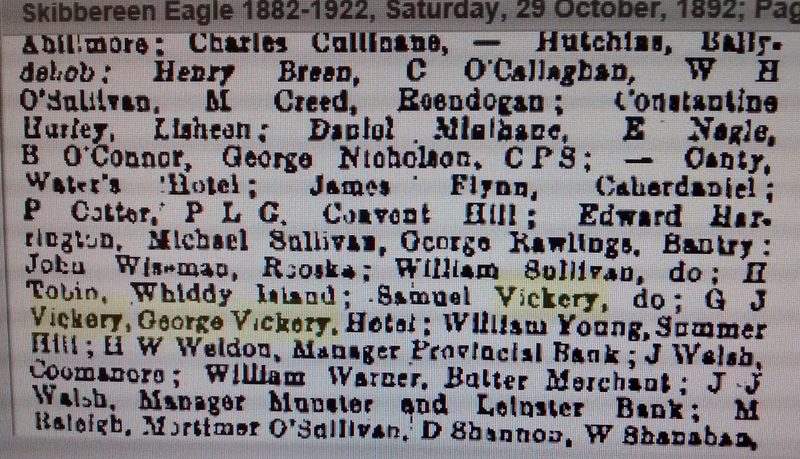 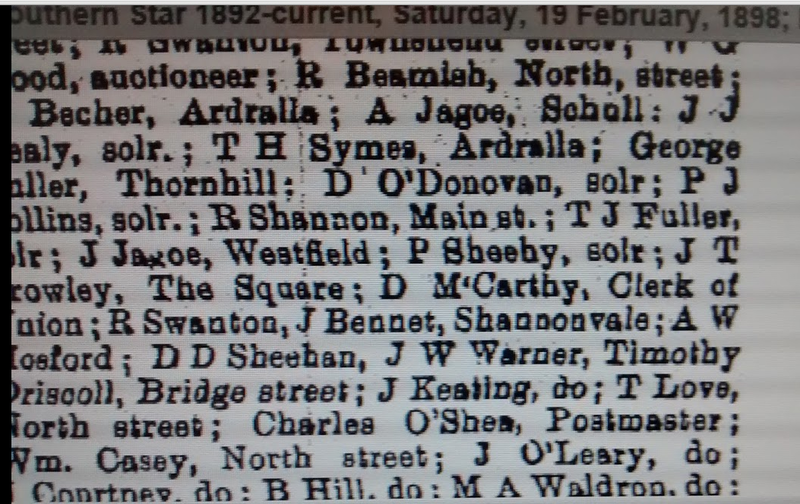 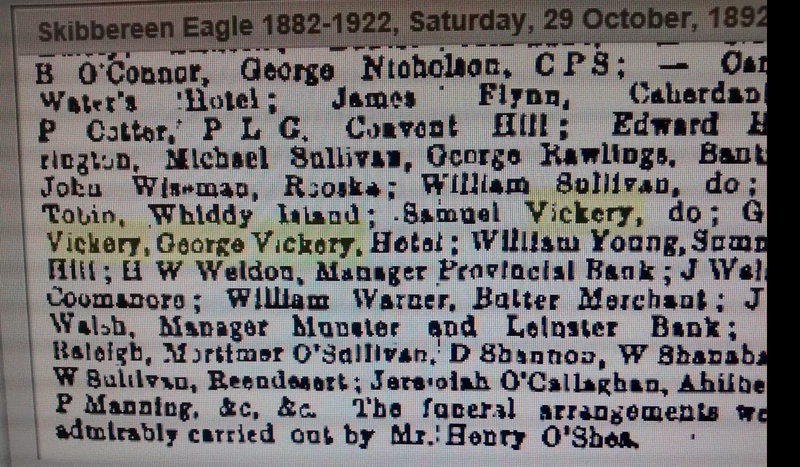 He swore O’Donovan Rossa into the Phoenix Club. 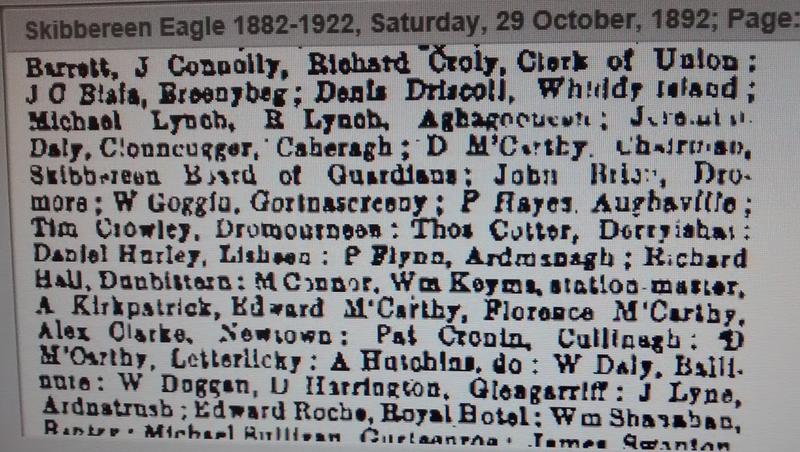 The Crowley brothers probably originated in Ballyourane, Caheragh next to Lissangle. 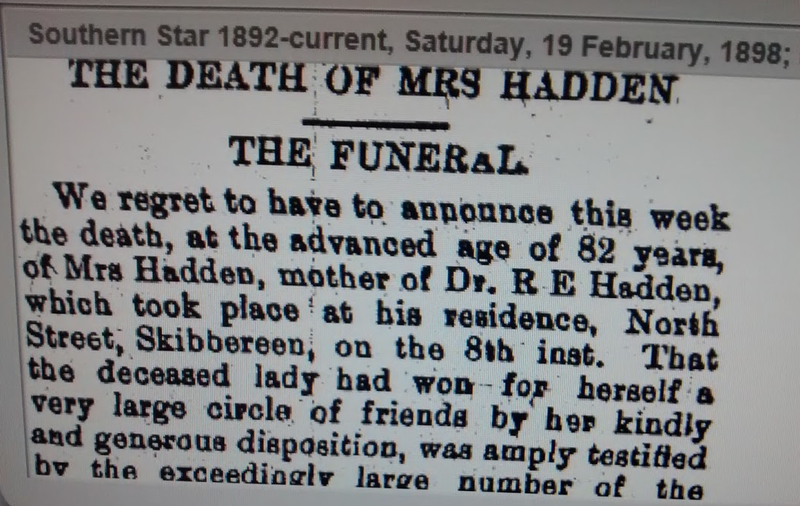 There are numerous Hadden relations in California and Australia. 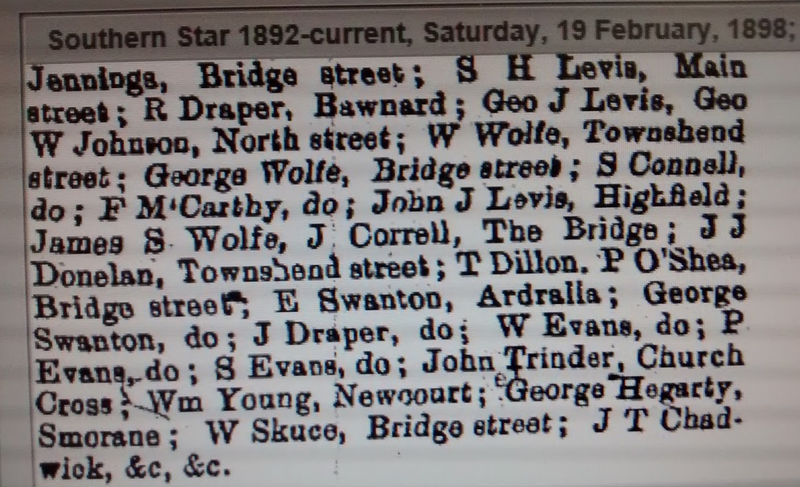 Among the attendance are representatives of the Ardralla Evans family presumably cousins. 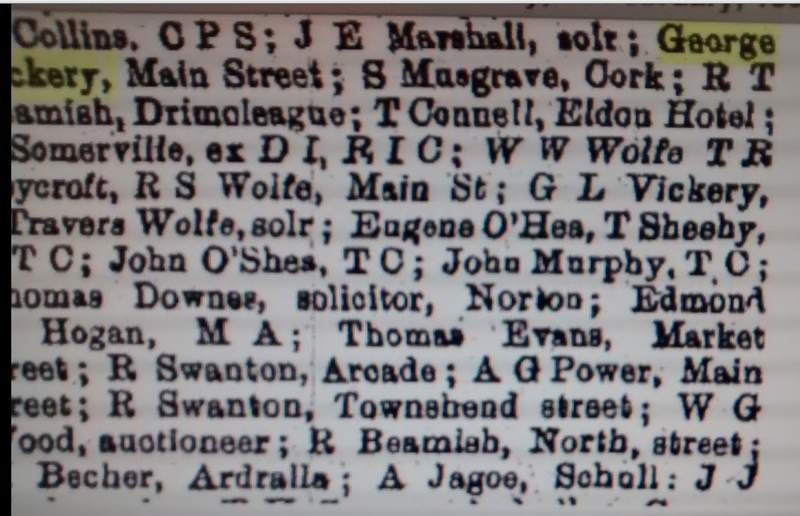 Musgraves of Cork are represented the same family who own the Supervalu business. 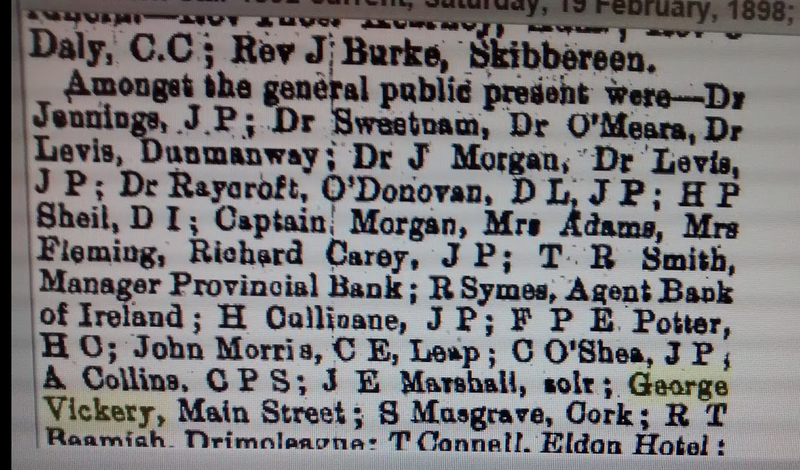 On the female line they are descended from the Bantry Warners all Methodists.